Tuesday was a beautiful sunny day. Even though the temperature was -8°C or 18°F I was dressed for the weather. My paints however, were not liking the low temperatures. They were stiff and hard to get out of the tube. My pochade painting box was not co-operating and I struggled to get my panel secured. Yes, a few curse words were muttered. Then, I could hardly loosen my tripod legs. I did eventually get set up, but frustration had set in. It took me a bit to settle down, and get into the scene. Some days just don’t seem to go well. I quit early with my painting only partially complete. Friday we got another beautiful sunny day, and the temperature was much warmer. I set out again to finish the painting. I made some changes this time out. My hubby is always bringing me home random items. He recently brought me a thermal lunch bag. Into this bag I put all my paint tubes, along with a hot water bottle. It really made a big difference in the paint. It was easier to get out of the tube and it seemed to remain workable much longer. It could also be because the weather was not quite as cold. Thankfully, I was able to complete the painting. 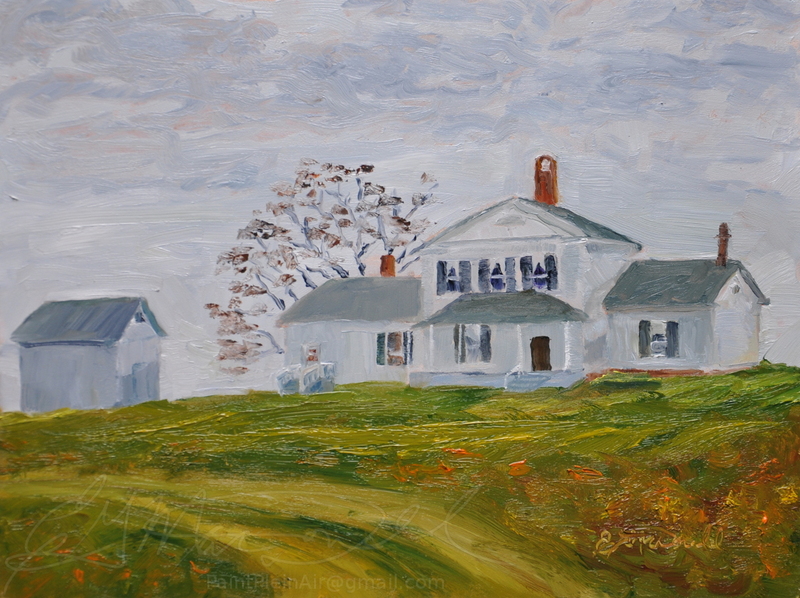 9 x 12 Oil Painting “Home Sweet Homestead” in its final stages on location. 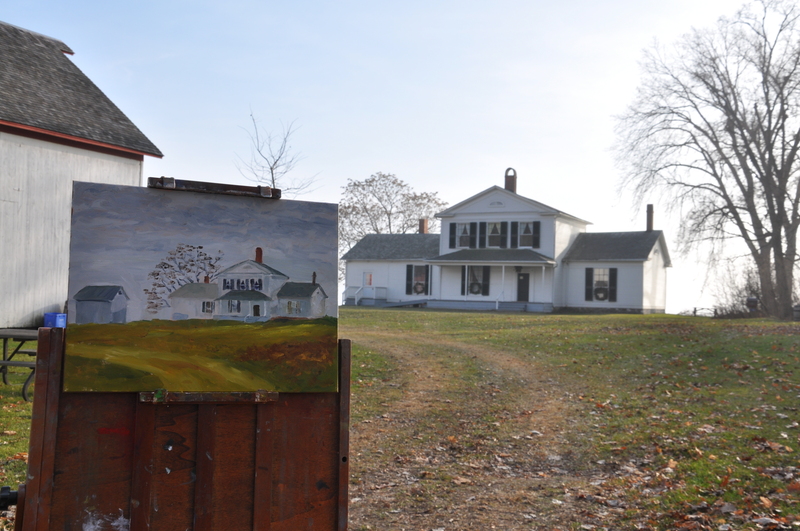 John R Park Homestead is one my favorite places to paint. It is part of the Essex Region Conservation Authority. 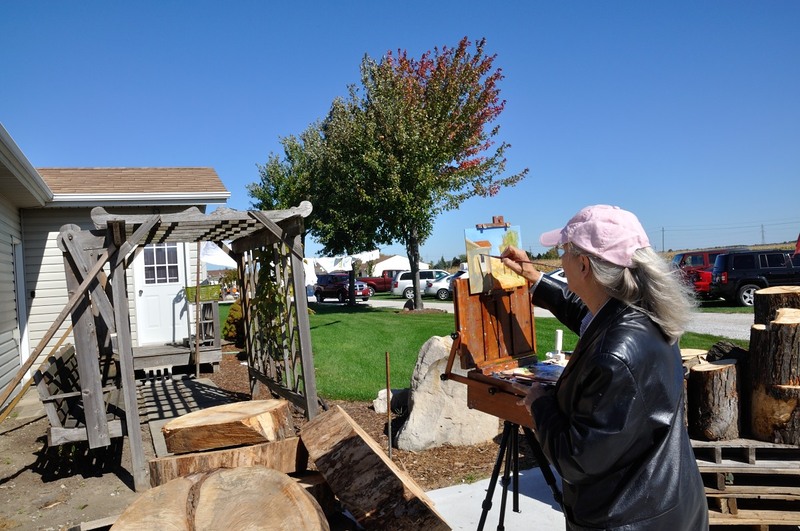 I paint on location here many times a year, and demonstrate plein air painting at many of their festivals. This beautifully preserved classic revival 19th century home was built 1842 on the north shore of Lake Erie. I am pleased to announce that my membership application to the Oil Painters of America was approved today. 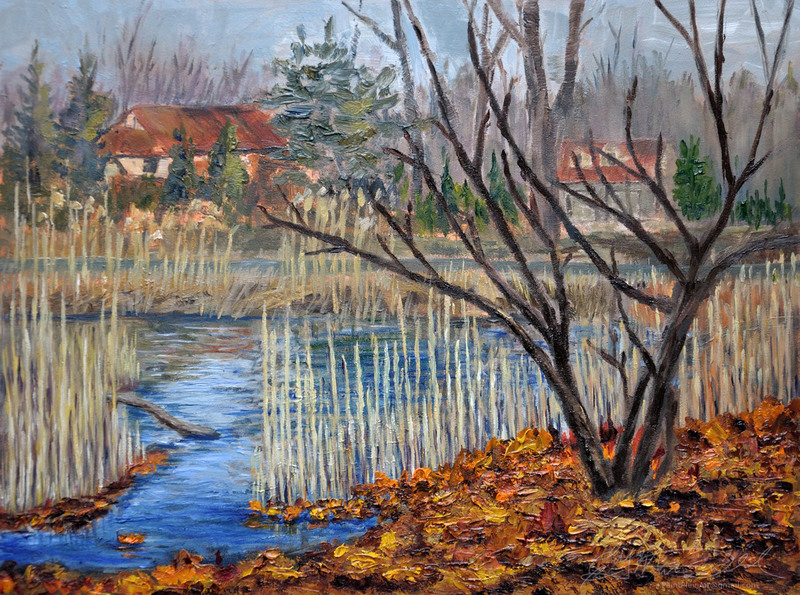 I will deliver this painting to the Red Brick Restaurant in Dexter this week. 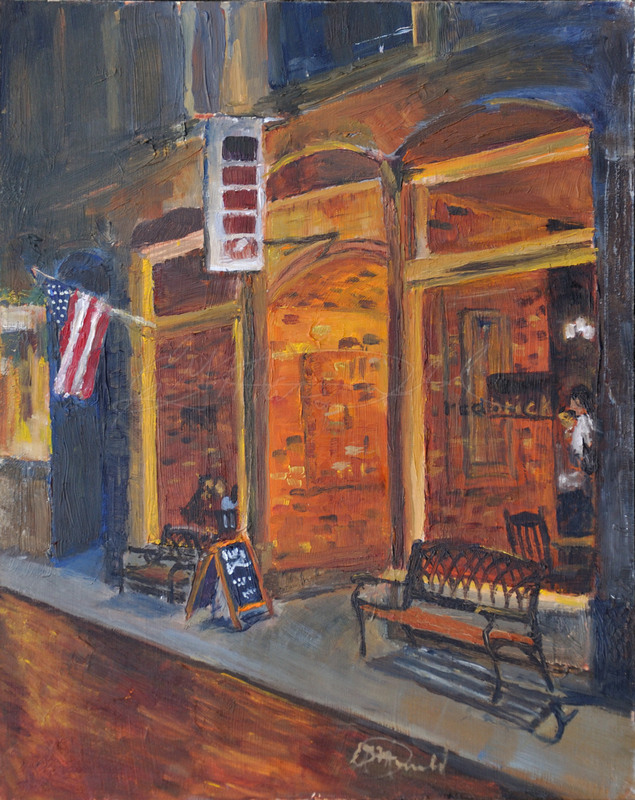 I was painting Night Visions at the Paint Dexter Plein Air Festival, and the owner asked for a commission of her restaurant. I came back on the last night of the event to complete the work. The temperature dropped down into the 50’s! This was August! I was not dressed for it, and ended up having to leave before I finished it. I ended up with laryngitis, but thankfully it didn’t last long. The laryngitis probably was due to all the talking I did during the event. Most of the work was completed on location. I added the people, benches and window lettering from a photo. 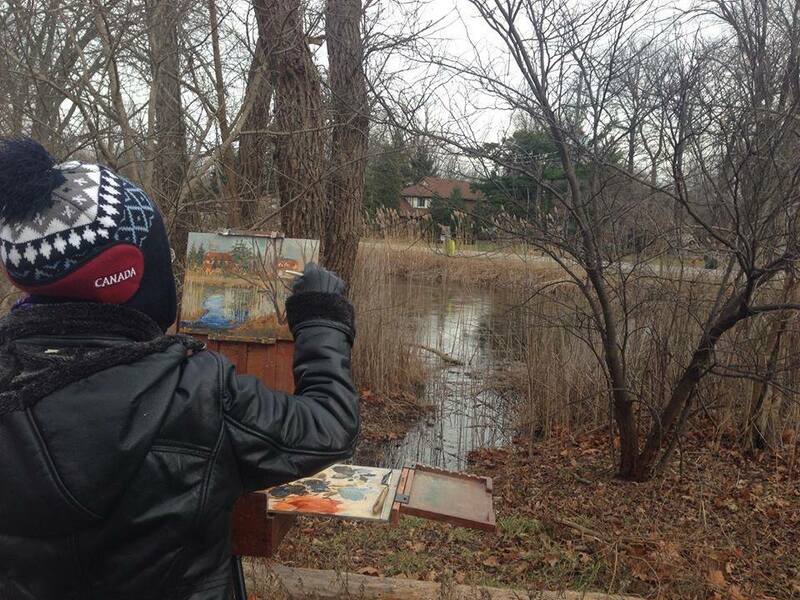 So, I think you can classify this as plein air. It seems I’m behind on a few paintings. 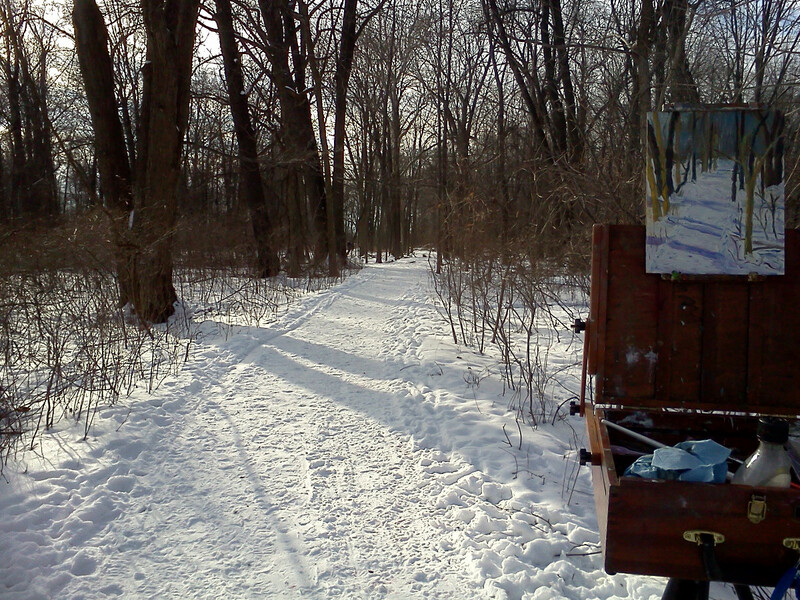 The group went out to paint December 1st at Ojibway Park. While winter weather had not quite set in yet, it was chilly, and damp. The water in the creek at Ojibway Park had not yet frozen over. Looking across the road from the Park entrance I could see a neighboring house. This corner of the creek was almost choked with reeds, not an easy subject at all. I participated at this great event to benefit The Kidney Foundation of Canada. 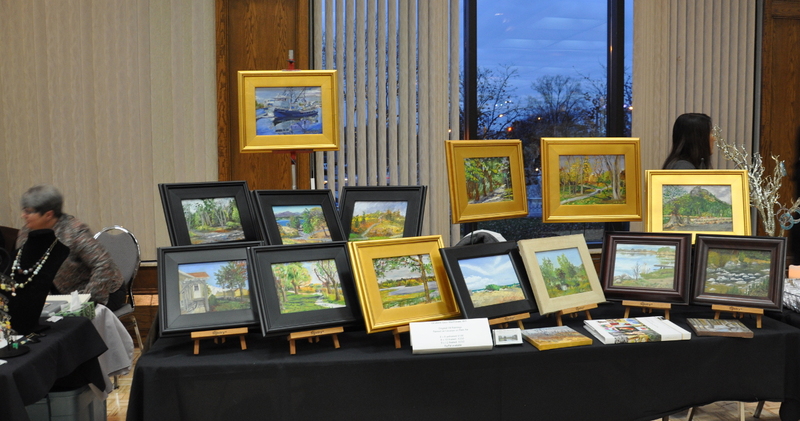 Two of my pieces found new homes at the event. While it was difficult to see them go, it was good to know they will be loved at their new home. Confidence! 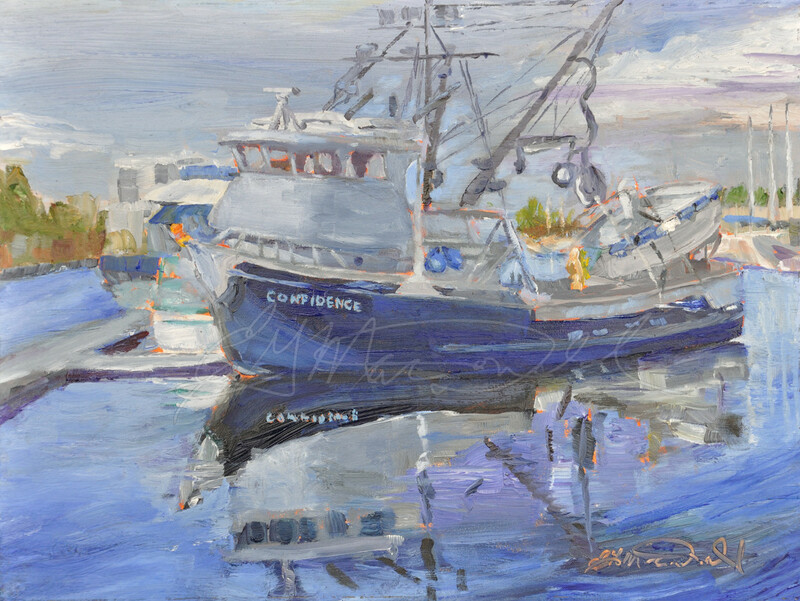 Fisherman’s Terminal, Seattle, Washington Plein Air 9 x 12 Oil on Ampersand Museum Series Gessoboard Sold! 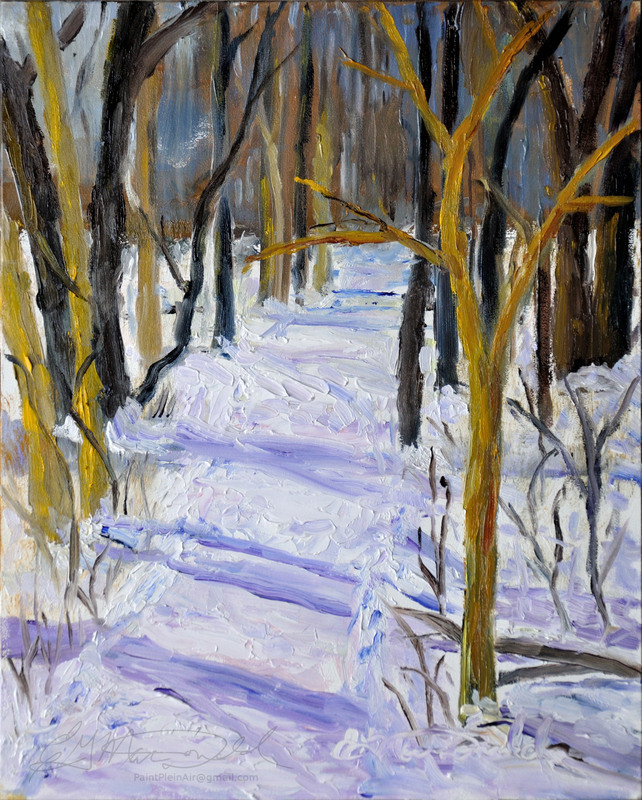 Joggers Dream 8 x 10 Oil on panel. Green Lake, Seattle, Wa. — at Green Lake Park. Sold! Wednesday November 12th Tickets $15. Doors open at 4:30. 5 – 8 p.m.
Full info call: 519-977-9211 or emuscat@kidney.on.ca. For only $15, sample and experience tasty creations from over 20 local restaurants in an all-you-can-eat setting, shop local artisan vendors, enjoy a complimentary McCafe coffee and more! Tickets are available at kidney.ca/Windsor or at your local RBC Branch in Windsor & Essex County. 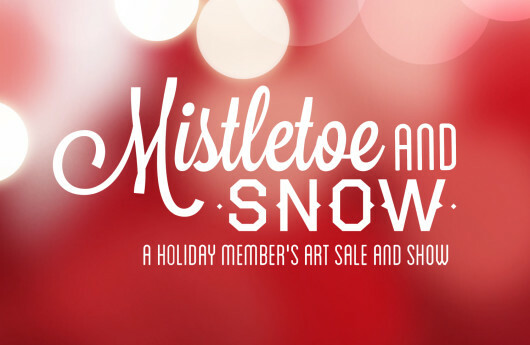 Be sure to like us on facebook at https://www.facebook.com/ArtiliciousWindsor for updates on this exciting event! Artilicious is proudly sponsored by Caesars Windsor, Riverview Steel, AM 800 CKLW, Eyes on Windsor, Biz X magazine, RBC, and Windsor Police Services. Title: The Coming Storm” 8 x 10 Oil on Ampersand Panel. EIGHT people came out today! WHOOT! I got to the site about 10:10, we start at 10:00. I like to be early, but today I was late because hubby had the car. Even though he got back to the house on time, it threw out my routine. I dropped him back off to his coffee club, but I skipped picking up my coffee and Egg McMuffin and went right to the park. 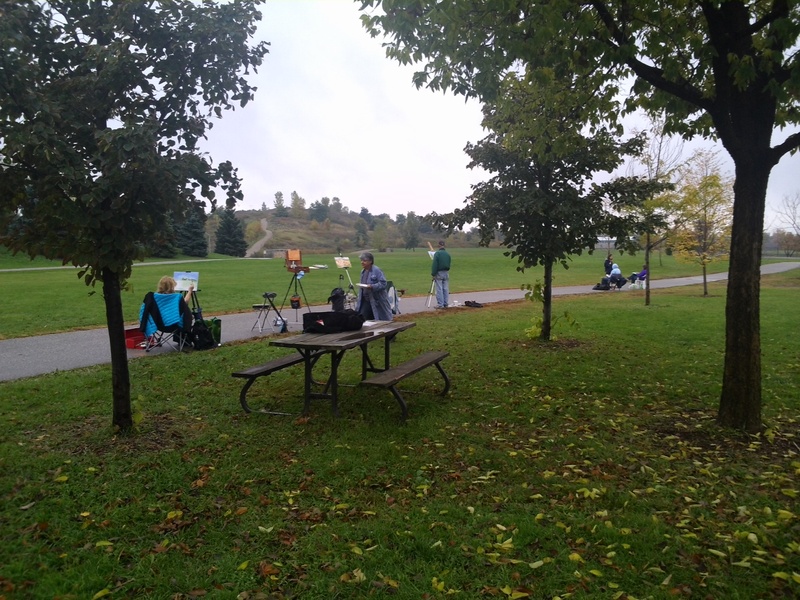 I was thankful to see two artists were already set up and painting, so I took off and got my brekky! I got back to the park around 10:30. 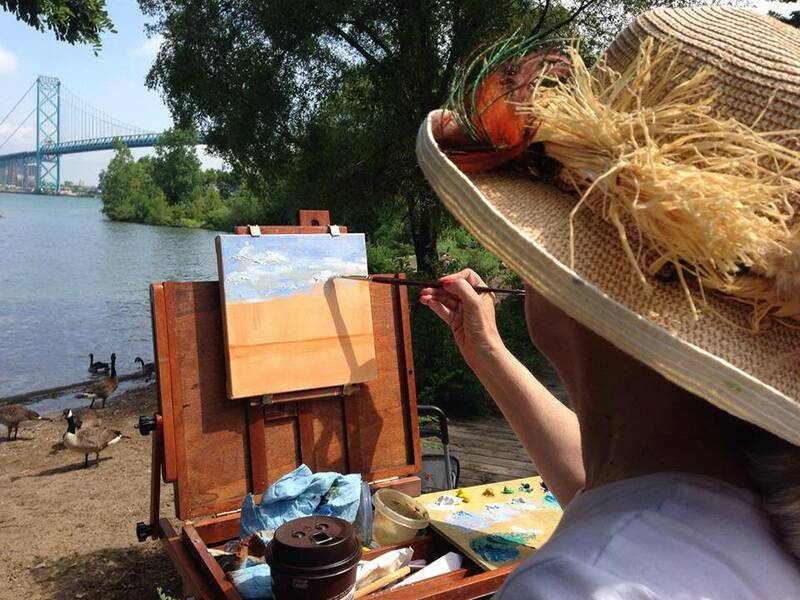 I spent the next 15 or 20 precious painting minuets eating and chatting with the group, but I love them and was not concerned about the painting time because after all the weather forecast said it was supposed to clear up by noon, and they are always right! More artists arrived. I finally set up, set out my palette and put the under painting on my board. I quickly sketched in the outline of my composition. The sky kept changing and getting darker, but it looked like the clouds were all staying to the south. Where was that promised sun anyway? My senses told me that I better treat this painting like I was in a quick draw contest and get er DONE! I used my palette knife and stuck to the paint I already had laid out on my palette. I moved very quickly with my small knife sculpting out the contours of the hill before me. It was around noon when it started… a fine mist, then a drizzle. I got my umbrella up, and my painting managed to stay dry. I popped it into the wet canvas carrier that’s built into my pouchade box. The paint on my palette was running all over, but I managed to get it cleaned up. EIGHT people came out today! WHOOT! We had to run for cover at noon. 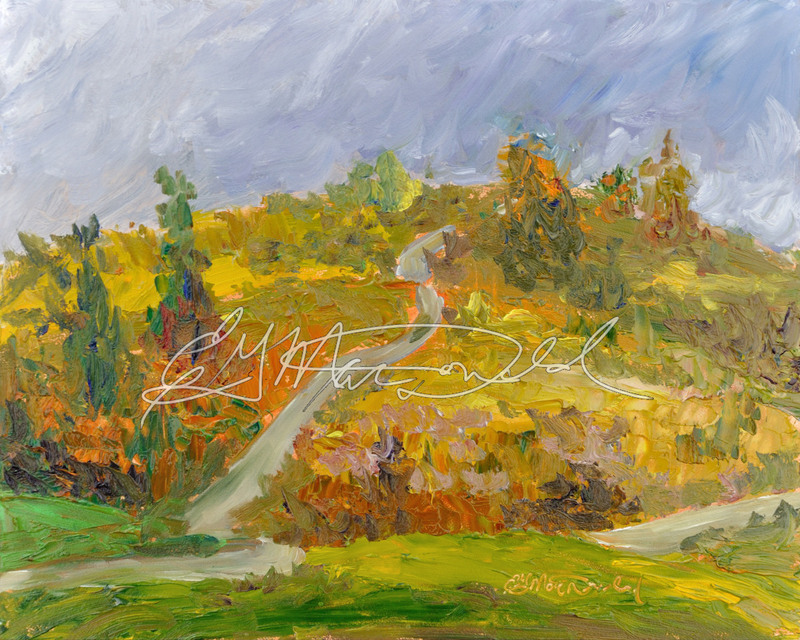 Seeing the dark clouds rolling in I treated this painting like a quick draw event. Now if I could only do that more often. Here are the results! 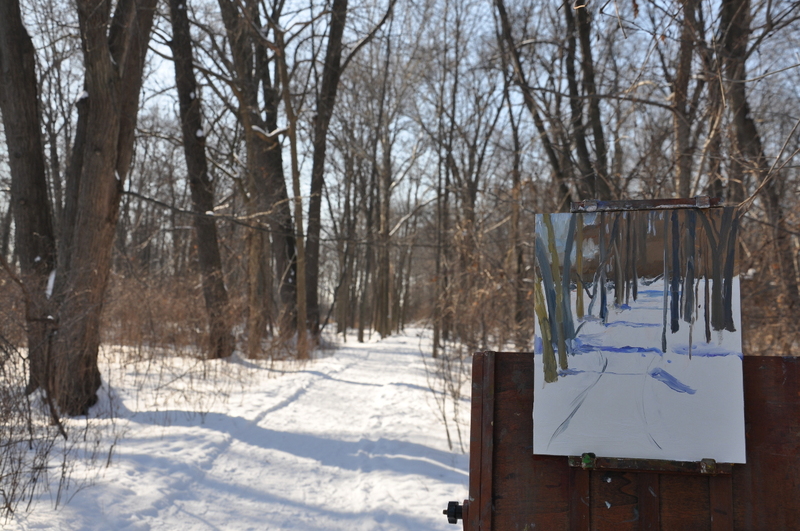 I also painted pretty thick with my palette knife. Now if I could only do that more often. — at Malden Park. Afterwards, we all formed a caravan to the nearest McDonald’s for coffee and a great chat. Wonderful, but breezy day yesterday out in the county. My umbrella turned inside out at least three times. Lucky it was easy to get it back, nothing broke, and my pochade box with painting did not fall over. Mind you, I had it strong armed the whole day. In spite of the winds I managed to complete this painting on site. The owner likes it, and it maybe sold as a Christmas present. I will frame it and take it back out to close the sale when it’s had a chance to dry a bit. What was really a funny co-incidence is that 30 years ago we bought our house from her son! What a small world! I’ve been very busy this summer. Currently I’m spending a month in Seattle, Washington. 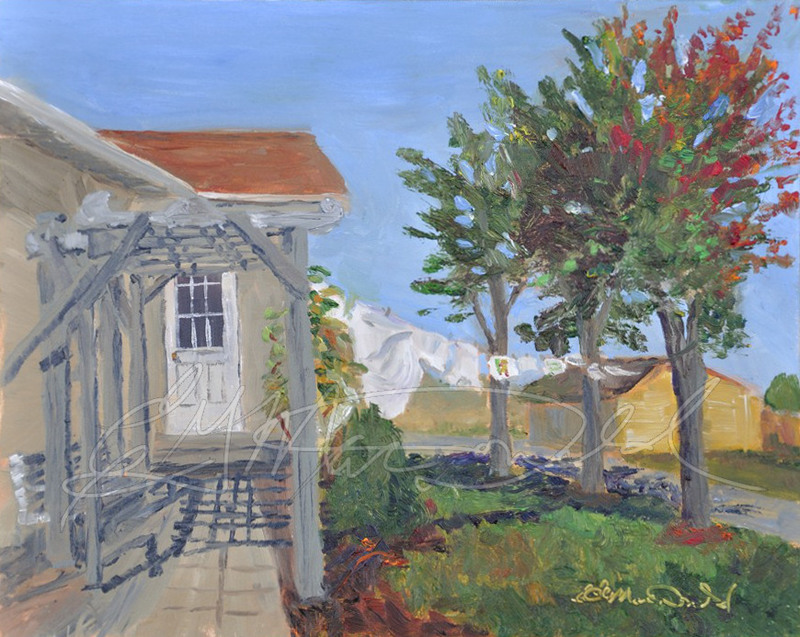 One of the wonderful things I’ve done while here is to paint with many Washington based artists. However, keeping you up to date is a problem because I can’t access the internet. I’ve taken some time out to visit a library so I can at least give you a look at one painting I painted at the Fisherman’s Terminal in Seattle, Washington. I have my brother and sister in law to thank for bringing me out to Washington for this great opportunity. I will be back home at the end of the month. Here’s hoping you can last that long between updates!